After the frigid temperatures of winter, your whole family is likely ready to spend some time outside. Many people associate grilling and outdoor kitchens with the summer, but the truth is you can have just as much fun by starting early. There's nothing more satisfying than that first warm day of spring. It's a reminder that summer is around the corner and winter will be gone for months. The best way to take advantage of of these beautiful warm, sunny days and evenings is to grill some burgers, corn on the cob or anything that gives you an excuse to use the grill. Families who have recently moved to suburbs may be experiencing their first chance to use their yard and outdoor kitchen. But first they may have to make the tough decision between buying a charcoal or gas grill. As Allrecipes.com pointed out, the biggest distinction between these two options are convenience and flavor. Many barbecuers have argued the merits of each, but what it comes down to is that gas can be used to quickly make a burger, while charcoal will impart a smokier flavor in a steak. For others, the actual differences may not matter. It can come down to perception. As Reluctant Gourmet explained, charcoal feels more hands on, but gas really is easier. You don't even have to worry about wind. Reluctant Gourmet, and many other experts who have weighed in on the debate, say that there's no right answer. Both grills serve a strong purpose. Some families even have both options. 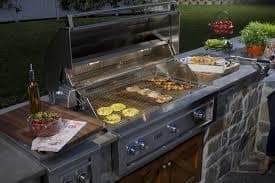 A large gas grill for a backyard cookout and a smaller charcoal grill for a few steaks. It all is eventually about taste – of the food and the preparation. Regardless of which type of grill you and your family choose, or if you already have one in the garage, an important part of grilling this spring will be keeping your grill clean. Here are a few tips to help you keep your grill clean for years to come so that you can keep that igniter firing and your food getting that hearty taste. If you're looking to buy a new grill, you don't have to worry about cleaning it right now, but next year you will. Making grill cleaning an annual spring event is a good way to ensure that it'll last for a long time. You don't want to scramble for the grill under the deck or in the garage mid-July when a few neighbors come by. Have it clean and functioning by the end of April every year, so that you're ready for anything. Cleaning and maintaining following the winter is a little different than mid-season cleaning. You'll likely need to clean the exterior as well as the interior. According to grill manufacturer Weber, the best course of action for getting the outside of your grill clean is simple warm water and soap. Glass cleaners and a paper towel may also be needed. For both charcoal and gas grills, you'll want to scrub off the carbon deposits off the lid on the inside. These look like peeling black paint and can come off with a steel brush. After this, warm soap and water will help the inside of the lid sparkle. The rest of the cleaning differs for each type of grill. A charcoal grill should be emptied of any ash and cleaned with soap and water. Don't forget to clean the trays that are built to catch grease or ash. On gas grills you'll want to carefully clear the areas where the flames come out. Read your manufacturer's advice on this first and make sure the gas is off. For many grills, the best way to clean the racks, which often may be coated in nasty grease, may be to put the racks in your home oven and set it to the clean function, HowStuffWorks advised. When you clean your oven, it will automatically lock and heat up to around 900 degrees destroying any food particles. During the year, cleaning is also important. So that you know it'll be clean every time you want to use it. Real Simple magazine advised people to spend as little as 15 minutes following their grill session to keep it clean. After you eat, put on some work gloves and go to the warm grill. Pull of the racks and wash them in soapy water. Place foil over the heating elements in a gas grill and scrub the lid and sides. If everything is still warm it'll all come off more easily. Don't forget to empty the grease traps and ash cans. Now you're ready for the next warm, sunny day when your family wants to barbecue.